Last updated: 30/10/2017	 Knap Down engine house, Combe Martin. The engine installed here in 1843 was a Sims combined cylinder, 26"/50", used for pumping in the adjoining shaft. 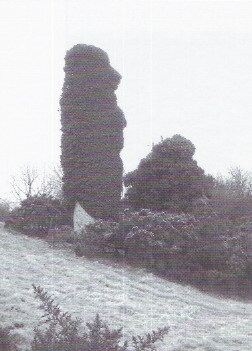 Over the last thirty years the ivy has really taken hold on the surviving stonework compare with the photograph in Atkinson, Exmoor's Industrial Archaeology, (1997), facing p. 96.